Mazda has developed a new advanced safety technology called ‘Smart City Brake Support' (SCBS), which helps a driver to avoid a frontal collision when driving at low speeds in the city or in slow moving traffic. The SCBS system will make its first appearance fitted as standard on the all-new Mazda CX-5 compact crossover SUV, which goes on sale this spring. The innovative SCBS system uses a laser sensor to detect a vehicle or obstacle in front of the Mazda CX-5 and if the driver fails to slow his/her vehicle appropriately, or to take avoiding action, SCBS automatically activates the brakes and reduces the engine output at the same time. In this way, SCBS helps to avoid collisions or mitigate the damage from rear-end collisions at low speeds, which are among the most common accidents. When driving at speeds between 2.5 and 19mph, a laser sensor mounted at the top of the windscreen detects a vehicle or obstacle in front of the car and monitors the gap and the closing speed. If the SCBS calculates that there is a risk of a collision occurring - if the driver were to take no action - it pre-pressures the braking system. This ensures a faster response when the driver activates the brakes or, if the driver fails to perform any avoidance manoeuvre or apply the brakes, an automatic braking operation is activated. Effective when the speed difference between the driver's car and the vehicle in front is less than 19mph, the system is designed to avoid or mitigate the damage from a collision. Mazda Motor Corporation is intensifying its safety-related research and development efforts, aiming for the ultimate goal of realising an accident-free and safe motorised society. Mazda intends to extend its advanced safety technologies, such as SCBS, to future new models, following its debut on Mazda CX-5, to contribute to provide all customers with driving pleasure together with outstanding environmental and safety performance. To welcome its first SKYACTIV technology vehicle to the UK, Mazda is offering retail customers of the all-new Mazda CX-5 compact crossover SUV a free upgrade to the Navigation version of their selected model, a low-rate (5.9% APR*) finance package and three years complimentary European roadside assistance. Customers can now pre-order a Mazda CX-5 at Mazda dealers across the UK, before this innovative model goes on sale this spring, and take advantage of these equipment, finance and ownership benefits which are available now and will continue through to the summer. "To celebrate the imminent arrival of Mazda's first vehicle with SKYACTIV technology, we are offering customers a range of attractive additional benefits," comments Peter Allibon, Sales Director, Mazda UK. 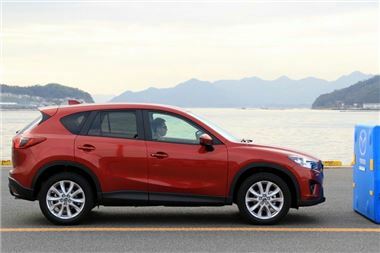 "Thanks to its solid environmental credentials - up to 61.4mpg and CO2 emissions as low as 119g/km - typically Mazda fun-to-drive performance, attractive pricing and unusually low cost of ownership for its class, the Mazda CX-5 will offer excellent value for customers wanting the latest in compact SUV driving, packaging and technology." The integrated navigation features TomTom technology and delivers three key benefits: practicality (advanced TomTom features), usability (large screen, live services and 45-country coverage) and security (built-in system deters theft). The main features are: integrated 5.8-inch touch-screen monitor, SD card-based map (4GB), audio, AUX input, USB and iPod controlled via steering wheel-mounted switches, navigation powered by TomTom technologies with Live Services - free for three months, then on subscription - and IQ Routes that uses data collected from other road users to calculate the fastest routes at any moment in time. The 5.9% APR Representative finance package is available to customers purchasing this new model on Personal Contract Purchase or Conditional Sale, over a period of 12, 24 or 36 months. On sale this spring, the Mazda CX-5 model range will feature an 18-strong line-up with prices starting from £21,395 and rising to £28,795 (OTR). The Mazda CX-5 will be offered with a choice of two engines with three power outputs (2.0-litre SKYACTIV-G 165ps petrol and 2.2-litre SKYACTIV-D 150ps or 175ps diesel), manual and automatic transmissions, 2-wheel drive (2WD) or all-wheel drive (AWD) and four equipment levels - SE-L, SE-L Nav, Sport and Sport Nav. Four petrol and six diesel models will come with 2-wheel drive, while all-wheel drive will be available for eight diesel models. Prices for 2.0-litre petrol versions start from £21,395 (OTR) for the CX-5 SE-L and rise to £23,995 for the CX-5 Sport NAV. Diesel CX-5 prices for the 2.2-litre 150ps models begin at £22,995 for the SE-L and step up to £24,295 for the SE-L Auto, to £25,595 for the Sport Nav and £24,695 for the entry-level AWD model. Prices for 2.2-litre 175ps high-power diesel models kick-off at £27,195 for the Mazda CX-5 AWD Sport. Customers can choose from eight exterior colours and black cloth or leather interior trim in black or stone - depending on model.